How long have you been a guitar tech, and how did you get into that line of work? This is my eleventh year. I was finishing up my history degree at Greensboro College in North Carolina, and I was pretty active in local bands, and the manager of a music store. We had both new and used stuff, and we had a guy who would come by once a week and take in all the repairs. When we sold a guitar or keyboard and something was not quite right, he’d come by and pick it up and take care of it. At one point, the workload got so big that he said, “Man, these guitars are just eating me alive.” So he showed me how to take care of the guitars so he could focus on the larger electronics. I did that for about a year and a half. I did all the warranty repair for the Fender and Gibson stuff in the shop. And then I was done with my degree, and my friends got signed to a label. They’re a band called Sullivan from North Carolina. They went out on their first tour ever with Bayside from Long Island, New York. In the middle of that tour, [Bayside’s] guitar tech had to go home for personal things, and I was like, “Well, I think I can do that. It beats selling T-shirts, so let me give it a go.” So Bayside hired me on. So here I am…as I said, this is my eleventh year. What other groups have you worked with? I have worked for Linkin Park and Frank Ocean. I spent three years working for Underoath, which was another really great opportunity, and I worked for a band called Say Anything. I worked for about two years with Gym Class Heroes before Panic! at the Disco. So I’ve kind of been everywhere, from hip-hop to large radio rock to smaller rock and everything in-between. I’ve been with Panic! at the Disco just at three years. I picked up with them in January 2014. How did the most recent Panic! at the Disco tour go? We had a busy 15 months. It was a really good, fun cycle for us. We were able to reach a lot of new kids and make some good impressions on people. The record did really well and the tour went really well. Roland definitely helped us out. We were in a position to go on this arena tour, and we needed more pianos than we’ve ever used before. And by chance, our tour manager was in contact with the guys at Roland. 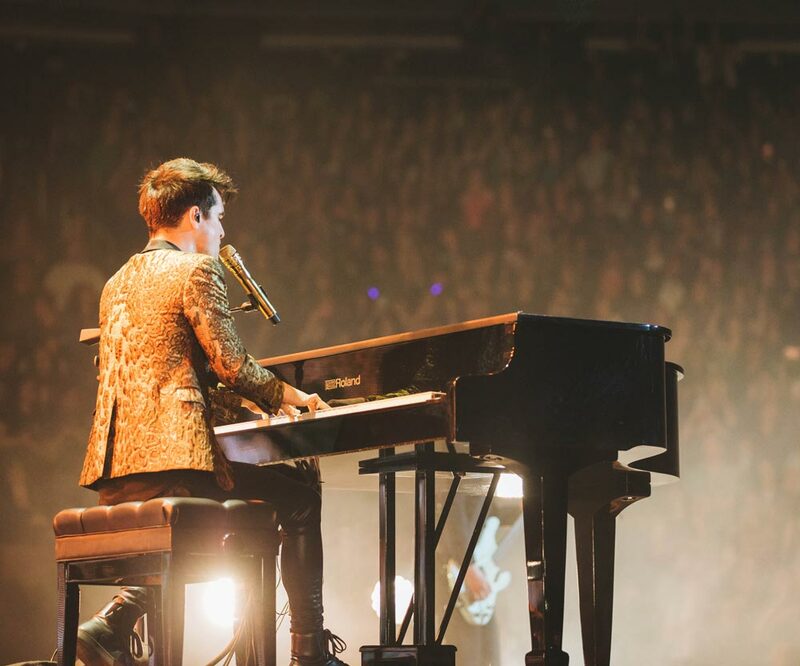 They sent over some pianos for our singer (Brendon Urie) to try out, and for him it was like, pretty immediately, no question. The stage pianos that Roland makes are just superb. 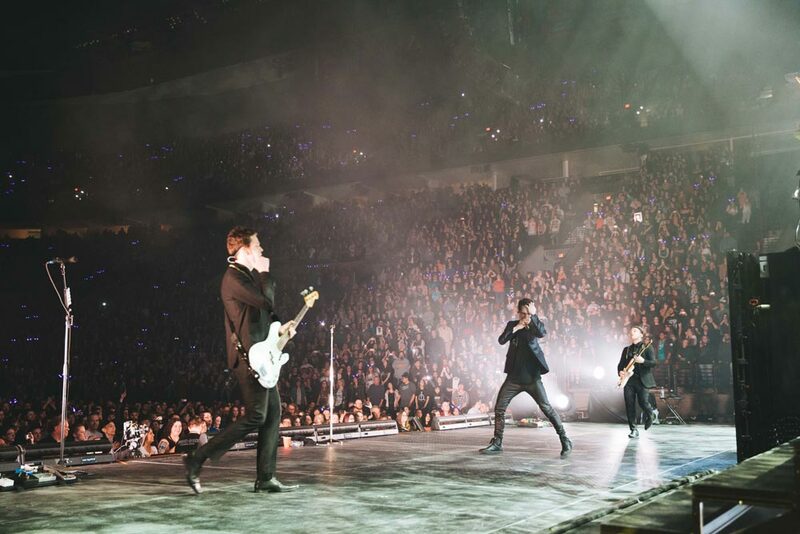 We had three of them out on that whole arena tour this winter. I understand you housed FP-90 models in grand piano shells. Yes, two of them. We had one on the main stage, and then we had a B stage. They were super-dependable and super-consistent. The playability was the big thing, how close the response was to an actual piano. 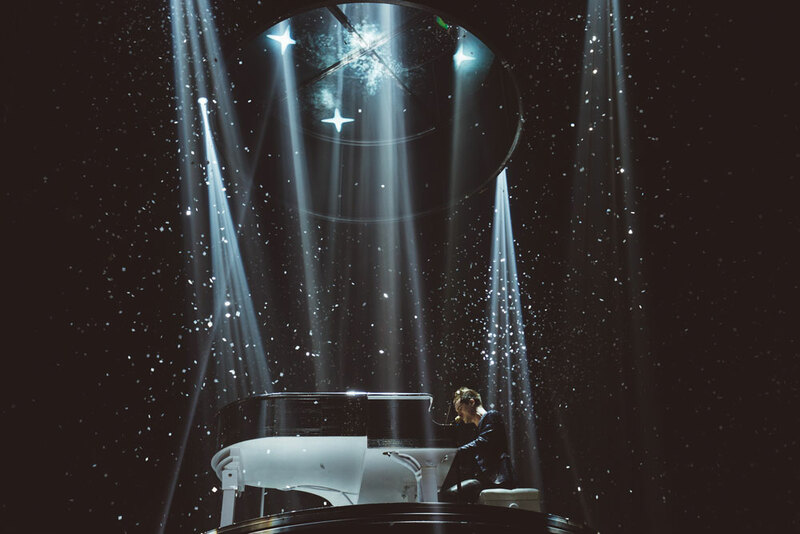 That was one of the main factors for Brendon—that the piano “feels” real. I think it helps to have that incredible Roland piano key response live. You mentioned a third piano. Was there another keyboard player? No, but that was like our backup. It’s always a good policy to have backup in this business. [Laughs.] And sometimes we would send it to the rehearsal room. We also had a Roland TD-11K electronic drum kit for the guys to warm up and mess around with. 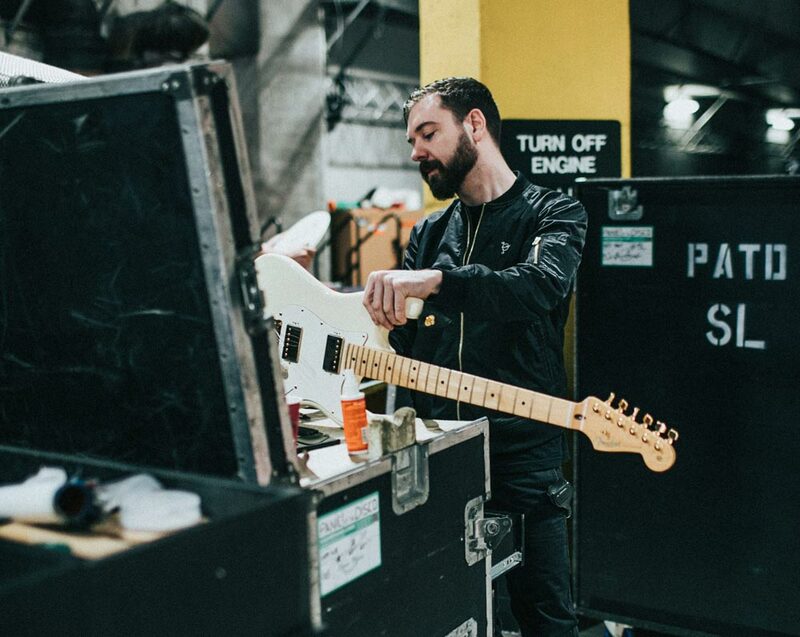 What are your daily duties as a guitar tech for Panic! at the Disco? Panic! at the Disco and most other gigs are pretty similar. Whoever you’re working for, you really want to give the artist consistent equipment and consistent signal for whatever that is, keyboards or guitars. Every artist is an individual, and their tastes are very individual. There are very specific things that they like to hear in their in-ear monitors or live. So it’s my job to make sure that, whatever the signal is, it sounds consistent every day. For Panic! at the Disco, I’ll build the the shells for the FP-90s, and get them installed so that people can dress the stage around them, because they’re centerpieces for our stages. And then I’ll head over to guitar world after that. I think I have about 13 guitars with Panic! at the Disco. I have a rotation of guitars that I restring every day, and I do a lot of general maintenance. The guitar players like their guitars to behave the same way every night. I try to be super detail-oriented and use my ear and my problem-solving abilities to give them something that literally sounds exactly the same every time they pick it up, no matter whether they’re in Russia or Baltimore or Los Angeles. So you’re primarily focused on working with Kenneth Harris, the guitar player? Yeah, I am primarily. And we have BOSS on every pedalboard that ends up on our stage. We use the BOSS tuners a lot. Stage left is the bass player; I’m not really familiar with his rig, but I know he has the tuner and I think one of the distortion pedals. On stage right, which is my world, the board is almost completely BOSS at this point. We have some of the Waza Craft gear, we have the DD-500 Delay, and a number of other BOSS pedals. Is he using the SY-300 guitar synth too? Yes. 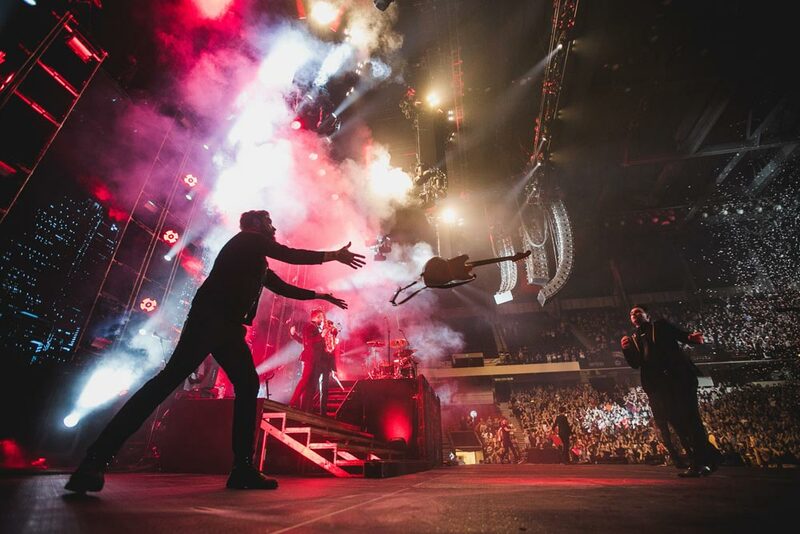 It kind of comes and goes, but when we’re headlining, we definitely bring it out. It’s a really fun pedal, because you can do so much with it. You can write entire intros with it and get a lot of soundscapes out of it. It doesn’t sound like a guitar, you know. We have a lot of fun with it because Kenny’s kind of a hands-on analog guy. He likes to be able to get down and make the signal really unique every night. The show’s pretty consistent, but there are also these little tricks and things. If you’re really listening, you hear something different happening every night. So he’s basically using the synth in improvised parts of the set? Yeah, like intros and transitions. And sometimes they restructure songs for larger tours and there will be little breaks in them, and he’ll put in a little ear candy. You know, things that wouldn’t be on the record, but that are unique to Kenny and unique to the vibe the guys are feeling at the time. When you go see Panic! at the Disco, you see a rock show for sure, but it’s not sterile. 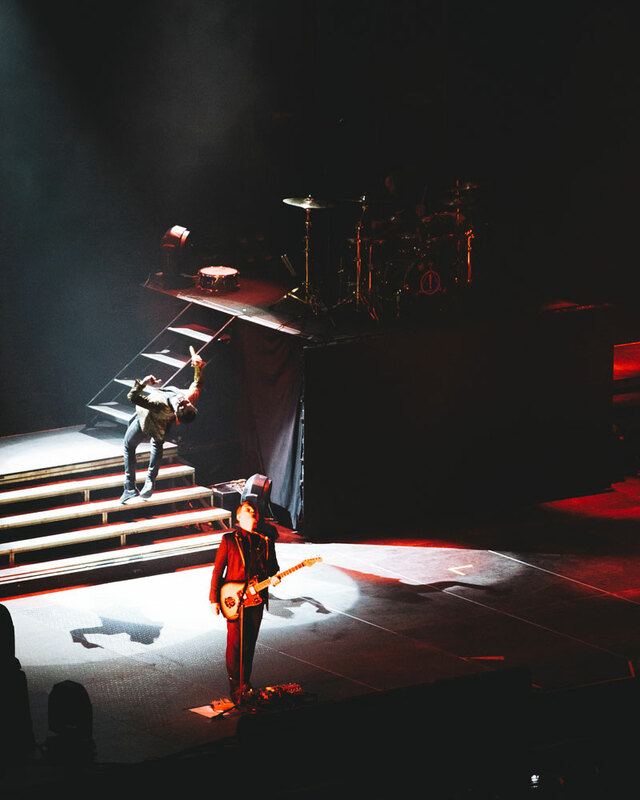 On the “Death of a Bachelor” tour, Panic! 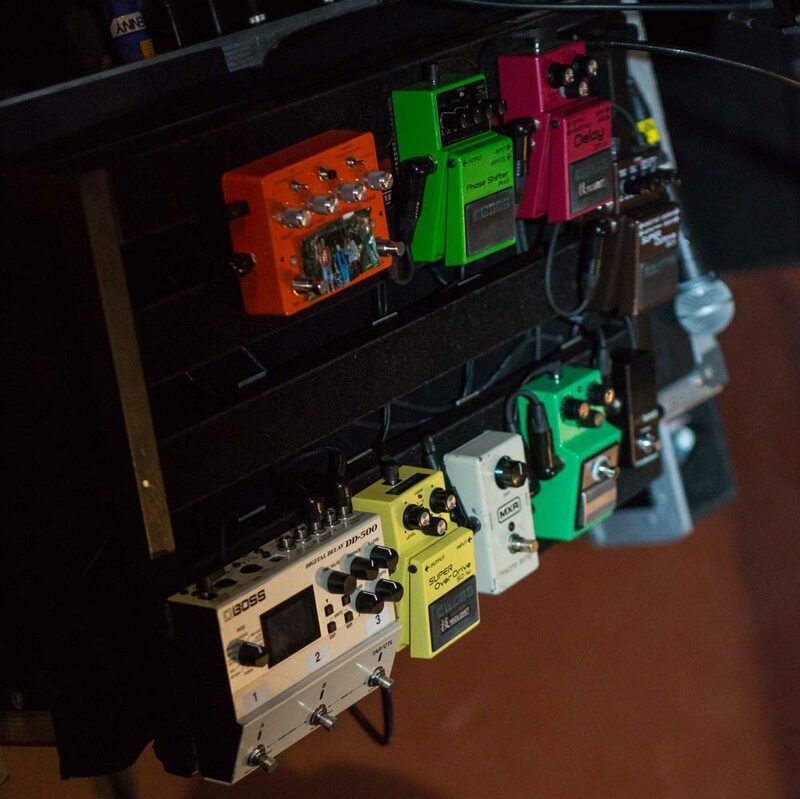 at the Disco guitarist Kenneth Harris used lots BOSS stompboxes on his pedalboard, including the SD-1W Super Overdrive, DM-2W Delay, DD-500 Delay, PH-3 Phase Shifter, and OC-3 Super Octave. He also added the SY-300 guitar synth for improv sections during the band’s headlining shows. Has he created his own patches for the SY-300, or does he use the presets? We’ve created three or four patches that he likes. Because he’s so hands-on, he even modifies those from day to day. That’s one of the benefits of that panel; you can interface like you would any sort of synthesizer, and get your hands on a lot of controls. It’s bankable too—you can go in and write your presets in order, and for a live application that’s infinitely valuable. You build the set list in the pedal, so you know the next time that you hit the next bank over you’re in the correct song and the correct patch. Another good thing about the BOSS effects, especially the Waza Craft stuff, is that they have their own character and tone. Like I said, it gives us the ability to put our own signature on every show, every night. Do you put together different size pedalboards depending on the gig that you’re doing? Yeah. We kind of bounce back and forth between two configurations. If we’re flying somewhere, we don’t always have the space available to bring everything, so we get creative in other ways. That’s another thing that’s great about the BOSS stuff—you can pull stuff out, put it back in, and make it up with other effects if you need to shed weight. One of the interesting aspects of the music world is that you might see a band on Good Morning America, but you don’t know that they just flew in from London, and they have other crews setting up for a show at Madison Square Garden. So sometimes we have to piece things out. If we’re just going to do two songs for television, we’ll take the key components out and leave them for the larger show. That way, it’s easy to transport. It becomes a logistics game at that point. If we’re doing one single on Good Morning America, I only need X amount of things for that. I can leave the rest of it at a another venue if we’re crunched on time. My favorite thing about the job is that every day is a new kind of algebra. You have an X and a Y, and you’ve got to solve one or the other. For me professionally, that gives me a lot of satisfaction. That and the fact that I’m part of something that other people can enjoy. I don’t care about being on stage; I like being part of a machine. I think that music is really important. I think it’s good for people to be transported by art and entertainment. It’s just nice to be part of the team behind the curtain. It sounds like your primary goal is to take all the technical issues away from the performer so they can just focus on doing their thing. You guys do such a fantastic job; I’m sure that most of the time the audience never realizes anything has happened. Yeah. That’s the space we want to be in. Like I said, as much preventive medicine as we can give. At the same time, it’s a skill you develop over time. There’s an entire library of sounds [in my memory] where I know exactly what the problem is when I hear it. [Laughs.] However, about once a year, you’ll hear something new that you’ve never heard before, and you just have to add that to your sound bank so you know how to identify that issue next time. Dan Pawlovich, the drummer for Panic! at the Disco, is using some Roland gear too. He’s using the BT-1 pads and the TM-2 module. He’ll strap the pads on in addition to his acoustic drum kit. He has the KT-10 Kick Trigger Pedal, and he has two pads at various places on the kit. They’re used to trigger samples of different things. Sometimes, when we’re at soundcheck, he’ll put a joke into one of the sample slots and play that and try to mess everybody up. [Laughs.] That’s a good part of the versatility of the TM-2 brain; you can just load samples up willy-nilly and they’re ready to go. It’s pretty seamless as far as where you want to use them. Do you have any advice for someone who wants to get into backline work? Thanks for talking with us Kyle.